Pompey's transfer business may have have slowed with Kenny Jackett getting the majority of his recruits in early. But the rest of the Blues’ rivals continue to make signings aplenty as the countdown to the League One campaign continues. Plymouth have continued their overhaul with three more arrivals in the past week. Derek Adams has taken a trio of defenders to Home Park to take his signings total this summer to nine. Peter Grant has joined the Pilgrims from Falkirk with left-back Ashley Smith-Brown arriving from Manchester City and Scott Wootton signing from relegated MK Dons. Plymouth have already signed Harry Burgoyne, Joe Riley, Freddie Ladapo, Conor Grant, Calum Dyson and Niall Canavan in a frenetic period of recruitment. Sunderland have also stepped up their squad shaping with a trio of deals completed. Former Pompey loanee Chris Maguire joins the Black Cats from relegated Bury. Northern Ireland defender Tom Flanagan has signed after leaving Burton with keeper Jon McLaughlin joining from Hearts. All of the signings are free transfers. New Fleetwood manager Joey Barton has got a couple of loans over the line in defenders Lewis Coyle and Tommy Spurr. Coyle joins from Leeds with Spurr signing from Preston. 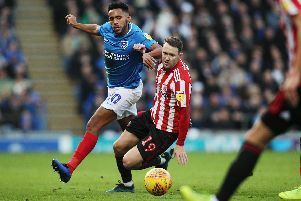 New Championship side Rotherham have completed a double swoop on Blackpool, who Pompey face in their second league game, to take striker Kyle Vassell and defender Clark Robertson on frees. Tangerines boss Gary Bowyer has offset their loss by bringing in defender Joe Bunney on loan from Northampton. Bradford's set-piece specialist Tony McMahon has agreed a move to Oxford with Accrington re-signing winger Piero Mingoia from Northampton. The Bantams have completed a piece of business, though, with Richard O'Donnell signing, also from Northampton. Charlton have bolstered their forward line by landing AFC Wimbledon striker Lyle Taylor, while midfielder Abu Ogogo moves to Coventry from Shrewsbury. Zeli Ismail (Bury to Walsall), James Hanson (Sheffield United to AFC Wimbledon), Tom King (Millwall to AFC Wimbledon), Matt Pearson (Barnsley to Luton), Aaron Wilbraham (Bolton to Rochdale), Andy Dales (Mickleover to Scunthorpe) and Timothee Dieng (Bradford to Southend) are the other League One deals completed last week.